"Once again we are reminded that President Obama has failed to keep his promise on immigration reform. In the absence of presidential leadership, states have acted on their own to serve their people and enforce the law, but the issue cannot fully be resolved with a president unwilling to keep his promises. This decision makes that job even more difficult, and it leaves Americans waiting for a plan the president promised to deliver years ago." [Updated at 11:51 a.m. ET] Mitt Romney, the presumptive GOP presidential candidate has released a statement on todays' immigration ruling. "Today's decision underscores the need for a President who will lead on this critical issue and work in a bipartisan fashion to pursue a national immigration strategy. President Obama has failed to provide any leadership on immigration. This represents yet another broken promise by this President. I believe that each state has the duty–and the right–to secure our borders and preserve the rule of law, particularly when the federal government has failed to meet its responsibilities. As Candidate Obama, he promised to present an immigration plan during his first year in office. But 4 years later, we are still waiting." The Romney statement doesn't really say if he agrees/disagrees w SCOTUS decision. [Updated at 11:43 a.m. ET] We're getting reaction from observers following the debate closely since day one. The decision is "a resounding defeat for the legislators of Arizona and other parts of the United States who think that immigration can be regulated at the state level," said Charles H. Kuck, managing partner at Kuck Immigration Partners in Atlanta. He predicted Monday's decision will affect Alabama, South Carolina, Indiana, Utah as well as Arizona. The court's message to the states is the same, he said: "This is a federal issue." The big question now, he said, is what Congress will do to fix the immigration problem. But he doesn't expect any immediate movement. "I would guess they won't touch this with a 10-foot pole until after they come back after the election." Dan Kowalski, editor-in-chief of Bender's Immigration Bulletin and an immigration lawyer at the Fowler Law Firm in Austin, said he thought the decision could be a swinging point on this type of legislation. "They're going to have to really almost go back to square one and really rethink their approach and how much time and money they want to put into these types of statutes," Kowalski said. "Number one: They're going to have to spend a lot of money on lawyers to try to craft something that they think can withstand Supreme Court scrutiny; Number two: they're going to have to budget money for further litigation because, no matter what they propose on a state level, it's going to be challenged. That costs a lot of money," he said. "So they're going to have to figure out if it's worth it." [Updated at 11:42 a.m. ET] Though both sides of the immigration debate are claiming some measure are victory, Justice Antonin Scalia let his frustration with the Obama administration known in his dissenting opinion, CNN Senior Legal Analyst Toobin said. Scalia even relied on hyperbole – saying Arizona would not have joined the union of the United States if it had known how the ruling would come down – in his attack on the White House. [Updated at 11:41 a.m. ET] CNN's Jessica Yellin has gotten reaction from an Obama administration official who says after first read of the ruling, it looks like a win for the federal government. It strikes down most provisions, recognizes the federal government’s supremacy in immigration law and enforcement, and narrows the reading of section 2, the administration official said, basically saying that state and local law enforcement cannot do any more than they already are allowed to do under federal statute in regards to requesting immigration status verification from the federal government. At the end of the day, the federal government sets the enforcement agenda, and decides who is removed from the U.S., the official told Yellin. [Updated at 11:27 a.m. ET] Janet Murguia, President of the National Council of La Raza told CNN that "striking down the other provisions is a victory we can claim,” but upholding any part of Section 2B keeps alive the threat to Arizona Latinos’ civil rights. Allowing local police to determine someone’s immigration status is a “huge problem and should be left to the federal authorities,"she said. “For us, it still puts a bulleye on the backs of many Latinos in this country,” she said. In remarks aimed at the candidates vying for the Oval Office in November, Marguia said she would like to see the nation’s top leaders denouncing all parts of the Arizona law, including Section 2B. “I think it’s very important that they reject this type of law as a model for the country,” she said, noting that Obama had already done so. “While we still want to fully review the Supreme Court’s decision, today’s ruling appears to validate a key component of Arizona’s immigration law, SB 1070. The Arizona law was born out of the state’s frustration with the burdens that illegal immigration and continued drug smuggling impose on its schools, hospitals, criminal justice system and fragile desert environment, and an administration that chooses to set enforcement policies based on a political agenda, not the laws as written by Congress. [Updated at 11:21 a.m. ET] CNN National Political Correspondent Jim Acosta reports that Mitt Romney's campaign is not saying anything and is being cautious, going over the ruling before making a statement. The issue came up repeatedly during campaign, Acosta said, and Romney says he stands behind the law. The GOP presidential contender has said he wants to make legal immigration easier and illegal immigration more difficult. “As a Latino it just frightens me that the leadership in Congress haven’t been able to tackle the immigration problem in this country. As a result of the lack of leadership with Congress, it’s left up to the states to regulate issues that are federal. And because of that we have police put in the position to stop people and ask for their papers, which puts them to act like an immigration agent. That is not the job of the local police. That is the job of immigration officers. That is a federal responsibility. It’s not up to the states to take on another burden on their shoulder’s. On the other hand, these are laws that have already been established at the federal level. So they’re creating a police state. [Updated at 11:13 a.m. ET] Digging a bit deeper on the one part of the law that was upheld. Justice Scalia, in his dissent, said the Az immigration ruling "deprives states" of basic "characteristic of sovereignty". iReport: How does immigration affect you? [Updated at 11:10 a.m. ET] CNN Senior Legal Analyst Jeffrey Toobin said he was surprised that Justice Elena Kagan kicked off the morning with the ruling that struck down mandatory life without parole for juvenile offenders found guilty of murder. The justices ruled 5-4, with Anthony Kennedy joining the four liberal justices, that it is unconstitutional to assign automatic sentences to juveniles and that judges must be left to decide the fate of those defendants. CNN's Jessica Yellin said the Latino community is still “measuring how to respond,” but it appears the Arizona law could become a “wedge issue” in this year’s presidential election. [Updated at 11:06 a.m. ET] Marielena Hincapie, the Executive Director of the National Immigration Law Center, told CNN that the ruling should be a message to other states looking at similar laws as well as those who already have them. "Any state that is considering following Arizona’s footsteps with respect to this racial profiling provision should take heed because we will be challenging those actions in court. And finally other states know that this is not the way to treat immigrants," Hincapie said. "With our diverse community and the way that demographics are shifting in this country, we must change the path. We have to stop following Arizona’s footsteps of pursuing policies of hatred and fear and instead trying to be inclusive and integrating immigrants into our community and respecting all of our constitutional rights. Gracias." [Updated at 11:02 a.m. ET] Confused by some of the reaction to the Arizona ruling? Who won? Who lost? CNN's Senior Legal Analyst Jeffrey Toobin said despite both sides declaring victory, this is “generally a mixed verdict” and both sides can claim victory. Essentially, the most controversial part of the law - the “so-called show-me-your-papers provision” - was upheld. [Updated at 10:58 a.m. ET] Arizona Attorney General Tom Horne said a “facial challenge” – that is, a challenge to the wording of the law - was expected. Other three provisions that were shot down are minor compared to the “big, controversial one” that is outlined in Section 2B, which empowered Arizona law enforcement officers to determine someone’s immigration status. “We want to be sure there is no racial profiling,” he said. The law was one that attracted a good deal of debate. 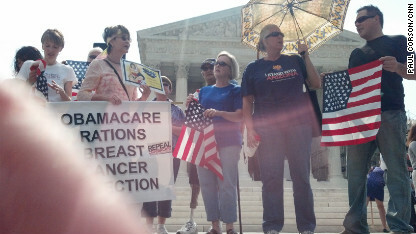 When the issue was in front of the Supreme Court in April there were plenty of protestors. [Updated at 10:54 a.m. ET] As we've noted before, the decision in the Arizona case could have wide implications for other states that enacted similar laws, following in Arizona's footsteps. One of those states is Georgia. Attorney General Sam Olens released a statement in reaction to the Arizona ruling. The Supreme Court also agreed today to review a decision by the 9th Circuit that held, for the first time, that forest roads used for timber harvesting must receive time-consuming and expensive permits, a ruling that threatens the continuing viability of timber harvesting across the country. [Updated at 10:52 a.m. ET] CNN Political Analyst Gloria Borger added that the upheld portion of the Arizona law could still be challenged in a lower court, and the ruling “limited the authority of what Jan Brewer’s police officers can do” because they can stop someone but they cannot hold somebody without contacting federal officials. [Updated at 10:51 a.m. ET] The one key provision that was upheld in Arizona’s "draconian anti-immigrant law will lead to racial profiling and discrimination," ACLU Executive Director Anthony D. Romero warned today in a statement..
Romero added that he was happy the door remained open for future challenges. Below is part of the statement sent out by the ACLU. “We are not done in Arizona and will continue the battle against discriminatory laws like these that encourage racial profiling and undermine the constitutional guarantee of equal protection. Today’s decision struck down three provisions of Arizona’s law, but upheld the notorious “show me your papers” provision, which requires illegal detentions and systematic racial profiling by local police. The court rejected the federal government’s argument that Arizona overstepped its power as a state. In a separate suit, the ACLU, along with a coalition of advocacy groups, will continue the fight to block the Arizona law as a violation of core constitutional rights, Romero said. [Updated at 10:46 a.m. ET] Arizona Gov. Jan Brewer released a statement regarding the Supreme Court's decision today calling it a "victory for the rule of law." "Today’s decision by the U.S. Supreme Court is a victory for the rule of law. It is also a victory for the 10th Amendment and all Americans who believe in the inherent right and responsibility of states to defend their citizens. After more than two years of legal challenges, the heart of SB 1070 can now be implemented in accordance with the U.S. Constitution. While we are grateful for this legal victory, today is an opportunity to reflect on our journey and focus upon the true task ahead: the implementation and enforcement of this law in an even-handed manner that lives up to our highest ideals as American citizens. I know the State of Arizona and its law enforcement officers are up to the task. 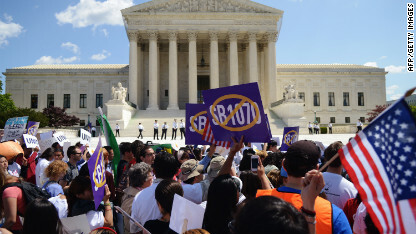 The case for SB 1070 has always been about our support for the rule of law. That means every law, including those against both illegal immigration and racial profiling. Law enforcement will be held accountable should this statute be misused in a fashion that violates an individual’s civil rights. The last two years have been spent in preparation for this ruling. Upon signing SB 1070 in 2010, I issued an Executive Order directing the Arizona Peace Officer Standards and Training Board (AZ POST) to develop and provide training to ensure our officers are prepared to enforce this law efficiently, effectively and in a manner consistent with the Constitution. In recent days, in anticipation of this decision, I issued a new Executive Order asking that this training be made available once again to all of Arizona’s law enforcement officers. I am confident our officers are prepared to carry out this law responsibly and lawfully. Nothing less is acceptable. Of course, today’s ruling does not mark the end of our journey. It can be expected that legal challenges to SB 1070 and the State of Arizona will continue. Our critics are already preparing new litigation tactics in response to their loss at the Supreme Court, and undoubtedly will allege inequities in the implementation of the law. As I said two years ago on the day I signed SB 1070 into law, ‘We cannot give them that chance. We must use this new tool wisely, and fight for our safety with the honor Arizona deserves.’"
[Updated at 10:45 a.m. ET] David Cole, a constitutional law professor at Georgetown Law Center said he was not surprised that health care issue will be last to be released. “They may not be political, but they understand drama so they’re holding on until the very last day,” Cole said. He conceded, however, that it may not be so much an effort by justices to keep Americans on the edges of their seats as it is a desire to take a few extra days to make sure they’re happy with the ultimate decisions. Cole said the court did not necessarily uphold the provision allowing law enforcement officers to check people’s immigration status when they are pulled over for a traffic violation or arrested for a crime. “All they said was it’s too early to tell before it’s actually implemented whether it’s inconsistent with federal law,’ Cole said. [Updated at 10:40 a.m. ET] The Supreme Court will release Thursday all of its remaining rulings, including one on the constitutionality of the Obama administration's health care law, CNN Supreme Court Producer Bill Mears reports. "On the larger federal question of state vs. government, this is a clear victory for the Obama administration because it stated quite clearly the state can't pursue policies that undermine federal law," she said. "It’s clearly under the federal purview." AZ RULING SUMMARY: Win for federalism, not states. Gov. won on 3 of 4 provisions and 4th is essentially punted for poss. future review. Romney is heading to Arizona on this day of the court's immigration law ruling, for a fundraiser event in Scottsdale. AZ RULING: Court has overturned section of AZ law: b) prohibiting illegal immigrants to seek work, saying fed. law overrides this state law. [Updated at 10:29 a.m. ET] How did Americans feel about the Arizona immigration law before the Supreme Court ruled? A CNN/ORC poll conducted on May 29-31 found that 75% were in favor of it while 24% opposed it. CNN's Kate Bolduan, clarifying the ruling, said of the provision that was upheld: "If they suspect you have broke a law that is already on the books, they can check your immigration status" if theres reasonable suspicions a person is in the country illegally. [Updated at 10:26 a.m. ET] The Court ruled largely in favor of the U.S. government, striking down three parts of the Arizona immigration law, but the Court did uphold one the most notable provisions: A requirement that local police officers check a person's immigration status while enforcing other laws if "reasonable suspicion" exists that the person is in the United States illegally. [Updated at 10:18 a.m. ET] The Supreme Court has issued 5-3 decision in favor of U.S. government, with Justice Kennedy writing the majority opinion. Arizona may have understandable frustrations with the problems caused by illegal immigration while that process continues, but the state may not pursue policies that undermined federal law," the majority opinion said. AZ RULING: Scotus Blog reports that the court has ruled *against* the part of AZ's law requiring police to check status of anyone arrested. The majority concluded the federal government had the power to block SB1070, which would have given local law enforcement the power to detain and question the immigration status of those believed to be in the country illegally. The Obama administration had argued immigration matters were strictly a federal function. [Updated at 10:17 a.m. ET] As we read the decision, here's what we're looking at. The question before the court was whether states have any authority to step in to enforce immigration matters, or whether that is the exclusive role of the federal government. Federal courts have blocked enforcement of the state's tough law known as SB 1070, which targets illegal immigrants. [Updated at 10:15 a.m. ET] We now have a ruling in the Arizona immigration case law. The law was upheld in parts and struck down in others. We are now reading to see which parts have been upheld and which parts have been struck down by the Supreme Court. Stay tuned. [Updated at 10:08 a.m. ET] The court has thrown out a Montana state ruling on limiting spending in state elections, by saying it believes the historic Citizens United case applies to state elections as well. The court will not hear oral arguments on the case. The Court has also decided not to hear the case about the Mt. Soledad memorial cross near San Diego that was on public land. A court had ruled the cross can be taken down, and the decision now clears the way for that to happen. SCOTUS: who thinks we'll get the Az ruling today? Healthcare? [Updated at 10:01 a.m. ET] We have a ruling on the juvenile justice case, which involves the question of whether a 14-year-old can be sentenced to life without the chance for parole or if that was deemed cruel and unusual punishment, Bill Mears reports. The court has reversed an earlier ruling against two 14-year-old children and has issued an opinion in favor of the underage children, saying they should have a chance to argue for parole someday. It was a 5-4 ruling. Justice Kennedy was the swing vote in favor of the defendants. The ruling essentially means that juveniles cannot be sentenced to life without parole. Kagan opinion strikes down mandatory life w/o parole for juvenile offenders at #scotus. [Updated at 9:55 a.m. ET] A few people have showed up at the Supreme Court, some holding signs about health care and others about immigration. If a big ruling comes down today we could see that number grow. [Updated at 9:43 a.m. ET] In a few minutes the justices will meet in the "robing room "and they will all put them on and then shake each other's hands. It's a tradition before each public session, CNN Supreme Court Producer Bill Mears said. Then the Court will walk as a group down the hall before it is announced that the Court is in session. A grey box, containing the rulings, will be brought down to the public information office right next to where the reporters are. That's where reporters will grab a written copy, as the oral summaries are done inside the courtroom. Some reporters and analysts, including our own Jeffrey Toobin, are now making their way into the courtroom. At #scotus, the courtroom is now open. Time to go upstairs to watch . . . .Decisions promptly at 10 am EDT. [Updated at 9:21 a.m. ET] CNN's Kate Bolduan notes that if a health care ruling comes down on Monday, you can expect that moments after the big focus quickly turns to what's next. That means all eyes will turn back to Congress. House Speaker John Boehnber has said if the law is not completely thrown out Republicans will move quickly to repeal whatever is left of it. After that it gets a little trickier. We know that the White House and Congressional Republicans have had their messaging war rooms prepped. There's been listening sessions going through the different possible scenarios. Boehner put out a memo to his members that said nobody knows how the court's going to decide but there will be "no spiking of the ball," Bolduan reported. She adds that it is in effect Boehner stressing that while they clearly want the law to be struck down they don't want to look like they're doing a victory dance surrounding an issue that could provide a negative fallout for those who may lose their health care. It just shows how important this ruling is, Bolduan said. [Updated at 9:15 a.m. ET] Two other cases we could get rulings on today: the "stolen valor" case and punishment for underage murderers. The "stolen valor" case takes a look at a federal law making it a crime to falsely claim military medals earned and whether that speech is protected by the First Amendment. The justices will specifically be looking at the harm that a defendant caused when he lied about his past record. The question is: Can you put a price on honor? The court has traditionally been very protective of even unpopular speech, Mears said. The underage punishment case looks at whether youth murder suspect deserve a chance to some day perhaps be released from prison. In this case we're dealing with two 14-year-olds who have argued that it is cruel and unusual to force someone of that age to be sentenced to life without the possibility of parole. The case marks the Court's continuing look at how to treat underage criminals. A few years ago the death penalty was outruled for underage criminals. [Updated at 9:08 a.m. ET] CNN Senior Legal Analyst Jeffrey Toobin is also at the court this morning. In the #scotus press room. Nerd heaven in here! [Updated at 8:58 a.m. ET] CNN Supreme Court Producer Bill Mears is at the Supreme Court and there's about two dozen camera crews outside. So far, it is pretty quiet at the high Court. No protests, no demonstrations or big gatherings yet, Mears reports. There's about three dozen reporters, which is expected to grow. Whether we'll get immigration or health care today is still up in the air. One or both could come today, or none. And then we'll be back again Wednesday and Thursday to do it again. [Posted at 7:00 a.m. ET] The Supreme Court could hand down two major decisions on Monday morning that have been hotly debated since they have been passed: Arizona's immigration law and President Barack Obama's health care reform act. At issue is whether Arizona's controversial legislation on immigration was overreaching in its authority to enforce immigration matters or whether that is the exclusive role of the federal government. - Does the law overstep federal authority, particularly with the "individual mandate" that requires nearly everyone to obtain health insurance or pay a penalty? - Must the entire Patient Protection and Affordable Care Act be scrapped if that key provision is unconstitutional? - Are the lawsuits brought by the states and other petitioners barred under the Anti-Injunction Act and must they wait until the law goes into effect? - Are states being "coerced" by the federal government to expand their share of Medicaid costs and administration, with the risk of losing that funding if they refuse? If Americans don't start standing up for this country. We have lost America. The illegals have no respect for us. They refuse to learn our language They ignore the fact that they should have received an invitation before entering our country. What is wrong with our leaders to have allowed this to get to this point? way to kowtow to illegals, SCOTUS. anyone else you'd like to support with my money? You would find here amongst some other articles, posted texts on How To Burn Calories Fast And Easy. Thank you for every other informative blog. The place else may just I am getting that kind of information written in such an ideal method? I've a mission that I am just now operating on, and I've been at the glance out for such information. Maybe this is a federal issue, but if the federal government refuses to enforce its own laws, shouldn't the states do the job? Hi there, just became alert to your weblog through Google, and located that it is truly informative. I'm going to be careful for brussels. I will appreciate in case you continue this in future. Many other folks will probably be benefited out of your writing. Cheers! Their version of the laws is lawlessness.....that being said we should ALL, ALL OF AMERICA vote on the issue of whether these yokles should stay in office AND we should IGnore their dissent and go on forward with State laws defining and limiting access to our citizens lands and resources.... every governor should just explain that this decision will not be upheld , that they as Governors have no right to impose this lawlessness on their citizens. Good article,must learn something new everyday.